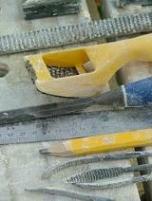 Once you have finished creating your masterpiece you will need to apply a masonry sealer to protect your stone carving. This is because soft stone like limestone is very powdery, and it will leave a dusty residue on any surface where you place it. Also if you decided to have your artwork outside it is necessary to seal it because the stone is very porous and absorbs moisture quickly. If it stayed wet for a long time the stone will go mushy and begin to break down so you need to have a good water sealant for limestone. Here is a photo below of of stone carving that has been sealed with silicone sealer. What type of block sealer do I buy? Purchase a waterproof sealer that is designed to use for exterior dwellings, buildings made out of brick and concrete - these are is great to seal limestone with. There are two types that you can buy (water based and solvent based). If you are new to stone carving then the water based silicone sealer may be the best option for you. The type I use is Waterproofer Type K Silicon Water Repellent. Mitre Ten sells this product in NZ, and it works very well for both interior and exterior sculptures, and has little to no odor. Normally it comes in a concentrate that you have to mix with water. The ratio I use is 1 part silicone to 14 parts water and I just use a pump spray bottle to apply it. Read the instructions for the type you get. You can buy silicone in a spray can but I wouldn't bother as it is cheaper in the end to buy the concentrate that you can mix yourself. The best place to purchase this product if you live in Christchurch is Mitre10 Bishipdale, 135 Farrington Ave. Some of the other Mitre10 outlets in the city don't stock it. 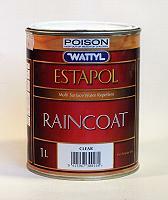 If you are from New Zealand or Australia then Wattle has a good product called Raincoat. I can get it from Bunnings or Mitre Ten. It is a fantastic block sealer for exterior sculptures, I usually use it for the large commissioned sculptures that I do for my customers but I wouldn't use it for smaller stone carvings that are to be displayed indoors as it is very fumy and it takes a while for the fumes to pass.